The latest telecom company to throw its hat in the streaming service is T-Mobile, which announced this week that it will be launching a new service called “TVision Home.” The service is expected to launch this week. According to the new TVision Home website, the new service will offer over 150 channels and will allow a high degree of personalization. TVision Home will enable voice control through Amazon Alexa or Google Home Assistant, access to Nest home security cameras, on-screen content from social media, and a built-in DVR with 400 hours of HD storage. TVision Home will launch first in Chicago, Dallas-Fort Worth, Los Angeles, New York City, Philadelphia, San Francisco, Washington D.C., and the Denver suburbs. More cities are expected to get the service soon. TVision Home will start at around $100 per month and offer a $10 discount for existing T-Mobile customers. One of the most attractive features of the service is the personalized home screen and separate user profiles, offering a level of personalization not typically found in other streaming services. Content from users’ social media feeds will be displayed directly on the home screen of TVision Home, mixing social and streaming content in a way the streaming world hasn’t yet seen. 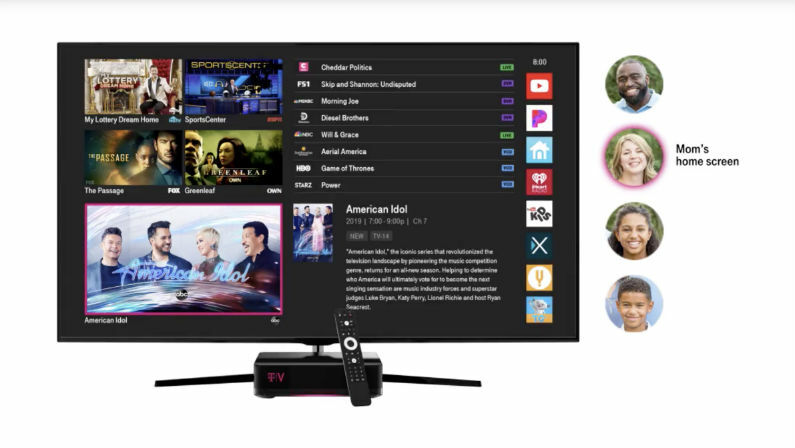 Aside from its own content, TVision Home will integrate with many popular television and music streaming apps like Pandora, iHeartRadio, XUMO, CuriosityStream, Toon Goggles, and HSN. The ability to add apps like add Netflix, YouTube, YouTube Kids, and Amazon Prime Video is expected in the near future. T-Mobile’s new streaming service will offer what it’s calling ‘Lite Boxes’ which connect to other streaming devices, allowing users to access their streaming content throughout the house without the need for a separate streaming device. The basic $99.99 subscription does not include premium channels, which cost extra. For $100 a month, you would think the service would offer something its competitors cannot. What niche is TVision Home attempting to fill? What does the service offer that the many other established streaming providers don’t? While having more choices for cutting the cable is always a good thing, I can’t see what makes TVision Home stand out in the already crowded streaming market.